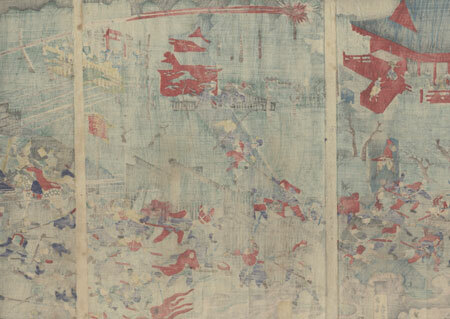 Comments - Rare six-panel woodblock print of the Battle of Ueno at Kaneiji Shrine in 1868. The battle took place between Meiji Imperial forces and samurai loyal to the Tokugawa Shogunate during the Boshin or Todai Wars of 1868-1869. Kaneiji Shrine was the most important Buddhist temple during the Tokugawa era. This amazing work depicts the Meiji soldiers on horseback and on foot streaming through the entrance into the shrine as shots fly through the air, exploding overhead. The samurai, armed with swords, spears, and naginata, were no match for the guns and cannons of the Meiji troops, although they fought bravely. Clouds of smoke and flames pour from the temple buildings the battle rages, with one warrior leaping off the roof of the structure at left. Rain slants across the scene and the sky is a stormy dark gray dusted with mica along the top edge. This amazing print is packed with action in a wonderful composition that flows across the panoramic scene. 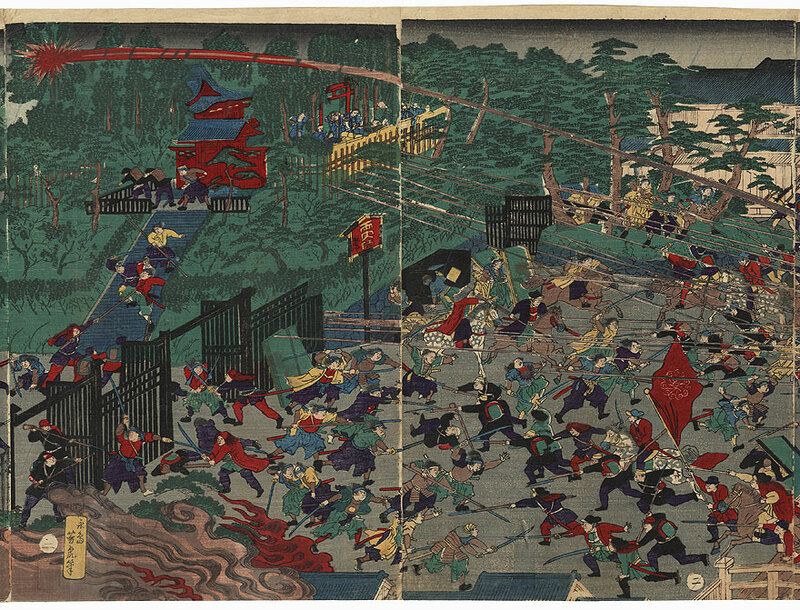 A fantastic print of one of the most famous battles during the Meiji Restoration. This is an absolutely outstanding woodblock, rare to find, finely printed with soft bokashi shading and rich, bright color. Condition - This print with excellent color and detail as shown. Six attached panels. Vertical folds. A few small tears and slight thinning at edges, repaired. Slight toning and soiling, a few creases. Please see photos for details. Good overall.